On Saturday, January 5th, a group of members from Young Farmers clubs across Northern Ireland travelled to Val Thorens in France to enjoy a week of skiing on the YFCU ski trip. 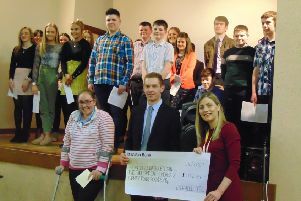 It had been several years since the last YFCU ski trip but with the YFCU president’s, James Speers, theme of ‘embracing change’ in mind, the idea was raised to organise a trip in 2019. The response was an overwhelming yes, setting the wheels in motion for a fantastic ski trip to France. The YFCU ski trip was booked through an experienced company, NUCO travel, who organised the flight’s accommodation and evening activities, making the trip fun and stress-free for all involved. This combined with fantastic skiing conditions and facilities, suited to all levels of skier from beginner to advanced, meant all the YFC members enjoyed a great week away regardless of their previous experience or skiing ability. “We had an absolutely fantastic week away! Val Thorens is the biggest ski resort in Europe with over 600km of piest. It is a world of skiing for both beginners and seasoned professionals, making it a great all-round trip for everyone.